Left to Right: Fayaz Ahmad, Suhail Sultan, Shams Irfan, Mohammad Raafi, Bilal Handoo, Riyaz-ul-Khaliq & Abdul Majeed Khan. It was an August afternoon in 2011 when I first knocked at a partially damaged wooden door, painted yellow, using less imagination or patience. It was Kashmir Life’s (KL) office in Srinagar’s Press Enclave, a weekly magazine, then in its second year of publication. After a few minutes wait, a skinny man, in his fifties, greeted me with a smile. He was Majeed Khan, the official driver of the organization, who would double as a general assistant, sometimes even as a cook on Friday evenings when the magazine was readied for publication. Trying hard to hide any hint of nervousness in voice, which all newcomers in media carry with them, I asked him about Masood Hussain, a seasoned journalist who went on to shape the narrative journalism in Kashmir’s fast fleeting newsy universe. “He is in a meeting,” Khan told me politely. “You can sit here and wait if you wish,” he said pointing towards a worn-out sofa placed oddly in the lobby. As I looked around, I saw over thirty pairs of shoes: red, black, white, and a few colourful ones as well, scattered across the floor. I also noticed that the entire office was painted in the same washed-out yellow as the door, and windows in pale green. It looked dull and serious; something I was not akin to while working in well-lit, air-conditioned office in Delhi, where I reported about Bollywood celebrities, Page 3 parties, fashion shows, film premiers etc. It was Basharat Peer who motivated me to come back and work in Kashmir. 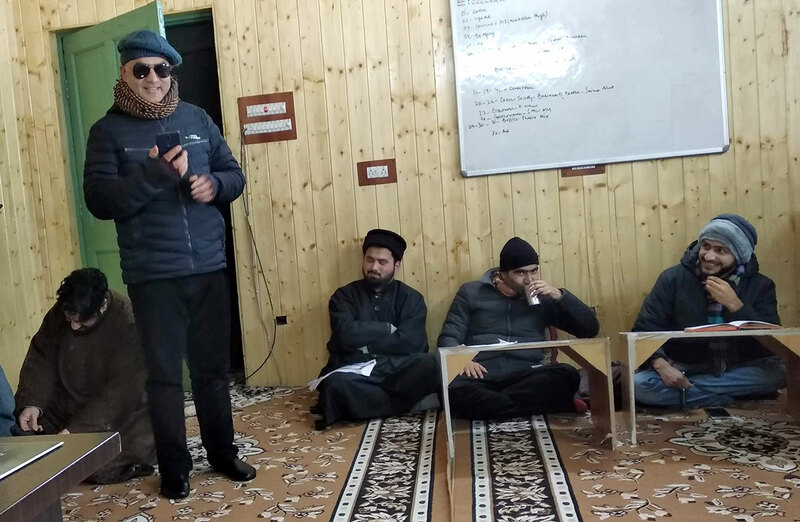 Instantly, I was skeptical about joining a media organization in Kashmir. So, instead of meeting Masood Hussain, who was in an editorial meeting surrounded by possibly a dozen reporters, I decided to take a stroll in Lal Chowk. However as fate had it, almost an hour later, I was back at KL office, sitting face-to-face with some of the finest journalists in Kashmir including the then editor, Parvaiz Bukhari. It was under his guidance my journey as a journalist started in Kashmir. I couldn’t have asked for more. The following week I was allowed to take part in KL’s weekly editorial meeting headed by Bukhari and Hussain. As a matter of fact, I had never seen story ideas getting discussed, discarded or dissected like this before. It was the first experience for a person like me who had known Kashmir only through Times of India and The Indian Express reportage. I was amazed to see how young journalists knew so much about Kashmir, its politics, history, conflict, strength and weakness. I recall sitting between Majid Maqbool and Showkat Nanda. They were stars in their own ways: one in reporting and another one in photography and editing. It was probably the first newsroom in Kashmir where girls outnumbered boys, literally. Over the next few weeks, I realized KL is unlike what I had experienced in Delhi. It was a small organization, both in terms of staff and revenue, but a highly professional one which worked on a single principle: it’s a family. And that sense of family kept it afloat all these years despite odds. Before my entry, I was told the pulls and pressures from both sides were keeping the KL staffers on tenter-hooks. The half-broken door was a testimony (Last week it was changed, almost a decade later.) As I became part of that family, it turned out to be a journey full of fun, excitement, challenges, where I was often chasing deadlines, visiting new places, meeting new people and reporting different aspects of Kashmir’s life. Soon it turned out, unlike other organizations, once you are part of KL, you automatically get involved in the entire publication process: from reporting to designing to printing. Those who have been part of KL know the importance of Friday’s. It’s the time when most of the staff stay overnight to see the week’s work reach the printing press. I remember how after dinner, we used to huddle around Parvaiz Bukhari and Masood Hussain, two veteran journalists, and listen to their experiences of reporting Kashmir’s crisis and tragedy. As an unsaid rule, a newcomer would only get christened as a journalist once he sails through Friday pressure at KL. But Fridays were not only about work. It was a fun filled process of exchanging ideas with your fellow journalists, irrespective of seniority or position in the organization. All new-comers, like I was back then, know how these post-dinner informal interactions help in shaping a journalist. But as I grew in the organization, these Fridays were eagerly awaited as entire staff would assemble in the office. Once done with the work, our editor Jehangir Ali, Sameer Yasir and others would sit around a desktop to watch the latest Hollywood movies, while Khan served endless cups of tea. During winters, we would hit Srinagar streets in the dead of the night looking for harissa and salt tea. 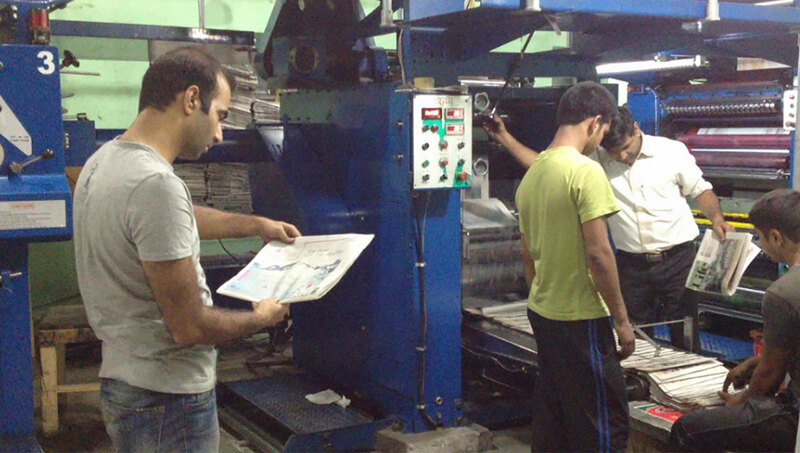 KL team at a printing press. All celebrations and parties are planned on Fridays only as the entire team is present. This is the day that remains dear to every person who has been part of KL. But unlike Fridays, KL’s weekly editorial meeting on Saturdays is always a serious business. No matter how good a story idea you come up with, it will be put to debate and discussed to the last detail before it gets approved or trashed. I remember how my first five ideas were trashed straight off for being too simple. Interestingly, every single journalist, including interns had equal say and power to trash any idea on solid and justified grounds, even if that idea comes from Masood Hussain himself. It didn’t take me long to realize that Kashmir Life encourages stories that see beyond daily headlines and numbers. I understood that KL has earned its reputation by offering its readers long narratives pieces that offer in-depth reportage. But not all approved idea would make it to the print, as KL’s story bank is full of stories that wait for the right time and situation to come out. There are some stories that got consumed after a three years gap. But then it’s all part of the profession. We all go by the unsaid rule that no story is bigger than one’s life. This realization would often fill our newsroom with a sense of duty towards our profession and seriousness. It was always Khan Sahab, the driver, who would ease the charged up atmosphere inside the newsroom with his one-liners, and at times, with funny dance skills. Khan, an unlettered man, one of whose task was to take manual butter-sheets to our printing press in Srinagar outskirts, would often crash into the newsroom at mid-night and ask in his signature style: is editorial ready? For him, the editorial meant the end of days’ work. Interestingly, to Khan’s bad luck, the editorial was never ready on time, but our magazine was always. Khan left KL in 2018, after nine years of association, but his jokes are still part of the newsroom folklore. I have made countless late night sojourns with Khan to our printing press just to make sure that paper reaches on time. On one such late-night visit to our web offset press, Khan and I decided not to print from there anymore as the quality was not good. That instinctive decision helped KL magazine to upgrade its print version from the web to digital. In 2010, after the killing of three locals in a fake encounter in Machil sector, Kashmir was put under curfew for months. It was a challenging time for journalists trying to report the crisis amid restrictions. The challenge proved a sort of a crisis for a one-year-old media house like KL. After every two or three days, Khan and Bahadur would sneak at night to their homes in Srinagar interiors to fetch essentials for the staff to keep their bellies full and minds free. This was done at great risk, as civilian killings were new normal on Srinagar streets. Once the life resumed on Kashmir streets, it took media another two years to report the full magnitude of the 2010 crisis and the trail of pain and destruction it had left behind. But unlike the 1990s, when the magnitude of the tragedy was huge and quite difficult to report entirely, 2010 was different because of social media. It was soon to change journalism entirely. Keeping in view the importance of social media in journalism, the first update of KL’s website was done as we upgraded from Jumla based platform to WordPress. In October 2012, on a lazy Sunday morning, I and our designer Wajid launched KL’s online news service. After we updated very first news item on our website, we went for lunch at a modest eatery overlooking historic Ghanta Ghar in Srinagar. It was our way of celebration. Since then KL’s social media presence has grown to over 1.1 million dedicated followers. It is the second most followed news page in Kashmir. But taking it to that position was not an easy task. It took hard work, sweat, sleepless nights, from a number of dedicated journalists like Shah Abbas, Riyaz Ul Khaliq, Saima Bhat, Mohammad Raafi and many others, to keep Kashmir updated about latest happenings in real time. On September 6, 2014, when Kashmir was hours away from major floods, KL online team was working overtime to keep people posted about coming danger. The last update KL website posted was minutes before Srinagar’s Press Enclave was inundated under 15 feet of waters. 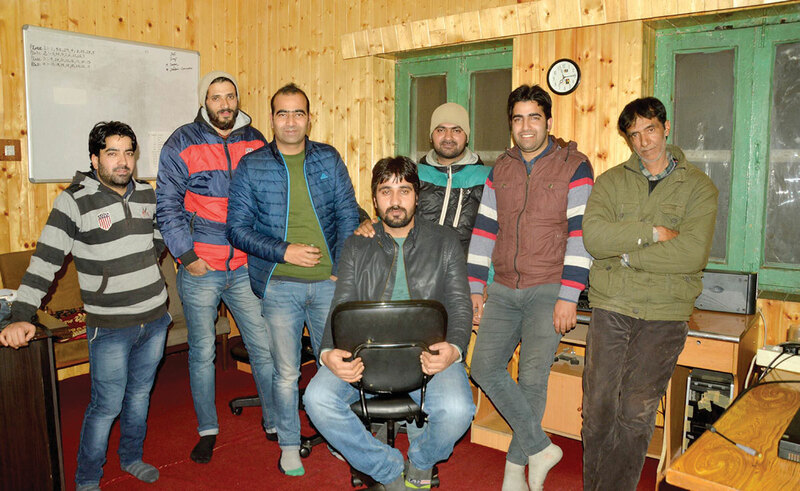 Post floods KL was the first media houses to restore its work from a make-shift office in Srinagar outskirts and reconnect Kashmir with the rest of the world. I still recall the mood when we assembled at the make-shift office while half of the Srinagar was still under water, and other half trying to scavenge whatever they could from the debris of their washed out houses. As journalists, we knew that the coming days are going to be hectic as almost every person carried a story within. The weeks that followed saw KL team was on its toes to report the aftermath of devastating floods. The reportage is now part of KL’s huge database used by researchers and journalists alike. Once the floods were over, Kashmir was soon to be gripped by another crisis, a much devastating and unending. Triggered by the killing of Hizb-ul-Mujahideen Commander Burhan Wani, Kashmir came to a crippling and deadly halt for almost six months. This was the most challenging phase for a journalist working in Kashmir. But the first challenge for every journalist was how to reach their offices located in Srinagar. I was one among them as I was in Tral at a friend’s house. It took me two days and multiple attempts to reach Srinagar where our online team was fighting sleep, fatigue and anger to keep tab of the dead civilians across Kashmir. For the next two months, the KL office was our home. We would visit our homes only at dawn and come back the next day at the same time if the situation permitted. Our small office kitchen was sort of a community kitchen for all the stranded journalists who couldn’t make it to their homes. But feeding a sizeable team was not an easy task as the food was scarce and hard to come by given the restrictions and curfew. It was Khan and Fayaz, our general assistant, who would risk their lives and drive around the city just before the sunrise to keep the kitchen running. But these food hunting trips stopped after the late night killing of Riyaz Ahmad Shah, an ATM guard from Srinagar’s downtown area. He was shot by CRPF personnel while coming back from his duty. The nights that followed were mostly spent in silence in newsrooms across Kashmir. After spending my day at Srinagar’s hospitals, where most of the pellet victims were brought, I would often sit near my newsroom window and yearn for the life on Kashmir’s most busy street, Lal Chowk. But there was nobody out there; the silence outside would often remind me of a graveyard. That silence was broken one night in mid-July when at 2 am, I saw half-a-dozen police and CRPF vehicles park silently across the Partap Park. Then one-by-one I saw hundreds of policemen get down and cross the park and enter Press Enclave. A view of Kashmir Life newsroom. I quickly rushed to the other room to alert my colleagues, who had just gone to sleep after a hectic day of reporting. By the time they got up, there was a commotion in the Press Enclave, as police vehicles were moving from one office to another seizing next day’s newspapers. We switched off all lights but kept ourselves ready for marshalling. To our relief, they only wanted to seize the message, not the messengers. I recall following police vehicle with Bahadur and Riyaz, through deserted and dark Srinagar roads, as it seized newspapers from prominent newspaper distributors. As ours was a weekly, our copies were not on the stands yet. The following three days saw Kashmir based newspapers banned from publication. But despite the ban, I am sure no journalist in Kashmir put his pen down, rather they followed stories even more passionately. I remember how one Friday night, when our online editor Riyaz was in deep sleep, an earthquake hit Kashmir. It was intense and shook the Bakshi era Press Enclave buildings to its core. Riyaz got up quickly and instead of running for his life, which was the normally wise thing to do, he grabbed his laptop and did a news item. It was at 3 am. But there were times when even the best hands in KL newsroom failed to hit the keyboard and report an event that had happened meters away from our office. It took Masood Hussain half-an-hour to report the few lines to break Shujaat Bukhari’s assassination.